This thesis investigates the diachronic development of correlative constructions like þa heo þa to þæm gemote ferdon, þa cwomon heo ærest to summum aancoran (lit. then they then to that meeting went, then came they first to some anchorite) and their characteristics in earlier English. 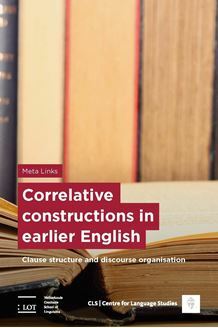 It offers a quantitative and qualitative analysis of correlative constructions (including conditionals) introduced by þa, ‘then’, þonne ‘then’, (g)if ‘if’ and when as well as an analysis of the use of discourse particles in correlatives. The studies in this thesis show that correlative constructions thrive on the (structural) possibilities arising from the development of Verb-Second during the shift from parataxis tot hypotaxis. Making use of morphosyntactic characteristics only available during the Old English period, correlative constructions overtly structure the discourse on a sentential and textual level via a subtle interplay between the available clause structure and discourse structuring elements like discourse particles and resumptive adverbs. While the former mark the speaker’s attitude, the use of the latter during the Old English period is found to be influenced by several clause-internal and clause-external features, such as the use of a discourse particle, mood, subject type, subclause length, text type and translation. Their loss from Middle English onwards surprisingly precedes the loss of Verb-Second and is triggered by the loss of þa and þonne as a conjunction, discourse particle and resumptive adverb, forcing in correlative constructions in later periods to adopt the new Subject-Verb order.